"Your Olympic Peninsula Fly Fishing Guide. 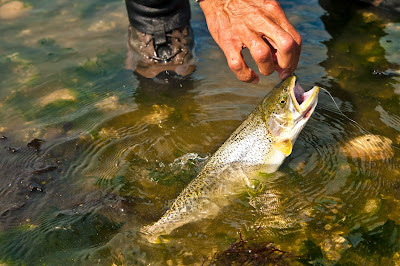 Catch & Release, Fly Fishing Only!" Despite some pretty extreme heat days this summer, these late summer nights are growing ever longer and cooler. Stepping out into the evening darkness, under the starlight, I can smell the deep scent of the cooling air and falling leaves already. Much of this is due to the recent drought that has caused some of the leaves to fall early. But it's also true that autumn is taking hold now. Without looking at the calendar you could feel it. And the fruit and vegetable crops have been way ahead all year. Some of the insect hatches here, like the termites, have been a little ahead of the normal times as well. The Autumn Equinox is less than a month away now. So even though we may get some more hot days ahead, it won't last long. That new moon coming on for the 1st of September will set the stage for some great tides and fishing this month too. We have missed the coho fishing this year. 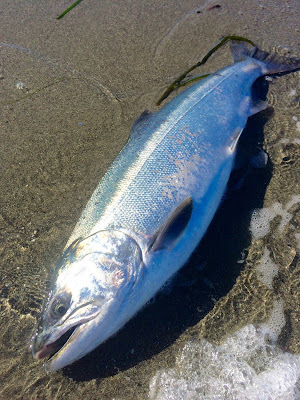 Ordinarily I would be haunting the beaches from dawn to dusk at this time of year, fly fishing for the ocean-run coho that have provided me with so much good fishing for years here. 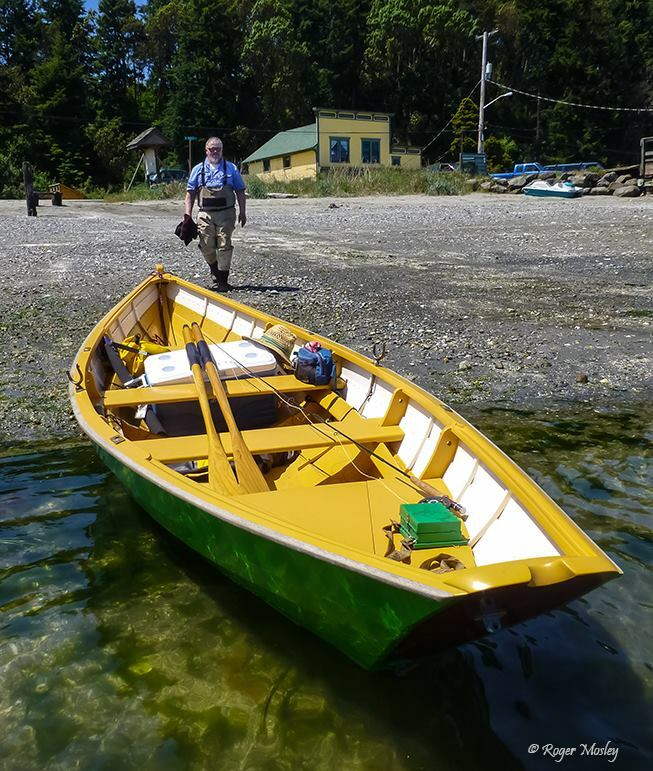 But perhaps no one else I know is as passionate about fly fishing for coho in Puget Sound waters as is Jimmy Lemert, owner of the famous Patricks Fly Shop in Seattle. Last year he set out to catch 51 coho in the weeks leading up to his 51st birthday. And he did it! Jimmy Lemert's 51st Birthday Coho. This year they closed the Puget Sound region coho runs to fishing before the runs even showed up. And last fall they closed all of the runs early, once it was obvious that the runs had collapsed. I appreciate the effort. But I have to wonder if it couldn't have been avoided by instituting some more conservative measures to begin with, years ago. Yes, we know that poor ocean conditions, and the persistent El Nino we had for a few years, have played a major role in the diminished runs here. But a big problem is also that we don't have great enough numbers of fish to survive these events to begin with. It is axiomatic that if you want a lot of fish, you need a lot of fish. And once you lose them, it is very slow going to get them back. I am really missing the beach fishing for coho. There have been enough optimistic fishing reports in other areas around the region this year to give me the impression that these fish can rebound, given time. I don't think that we should be fishing for them right now at all. Think of it as an investment in the future, rather than as a sacrifice. We can be grateful for the cooing weather ahead, as it will improve the fishing on the lakes and streams, and even on the saltchuck. Most of our rivers are still running low and warm, but this autumn cooling will help all of that too. Even so, we need those first good autumn rains to get things moving on the rivers again. Check the fishing regulations before you head to the coastal rivers this year, as some of the waters will close early to protect returning coho salmon. Even with the closures, you will find coastal cutthroat trout and summer-run steehead out here on the Olympic Peninsula rivers. One thing that I am grateful for is our wonderful, wild sea-run coastal cutthroat trout. And autumn is prime-time for these truly tough fish. Thanks for the blog. Its nice to read your perspective and benefit from your knowledge.